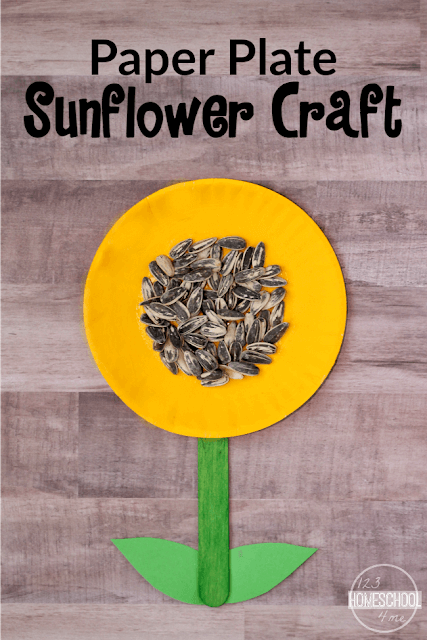 Celebrate the arrival of spring with this super cute Simple Sunflower Craft perfect to make with kids of all ages. It’s beginning to feel like Spring! The temperature has finally warmed up enough so we can spend some time outside and take walks around the neighborhood. On our walks, my children love to look at all of the things growing in nature and the flowers that are ready to bloom. After our walk today, we created a Simple Sunflower Craft. 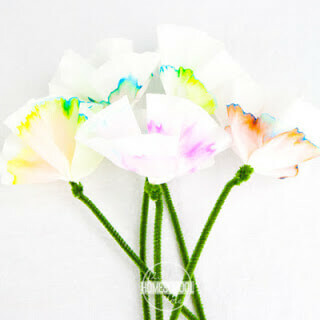 This flower craft is easy for young children to make and a fun Springtime activity. 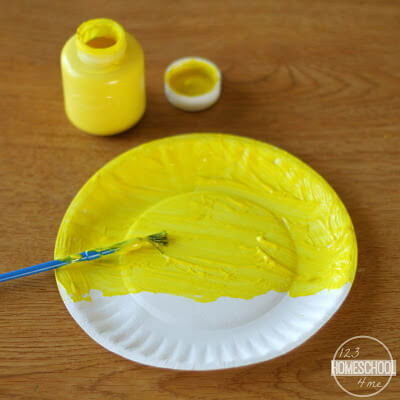 First, paint the small paper plate with the yellow paint and paint the large craft stick with the green paint. 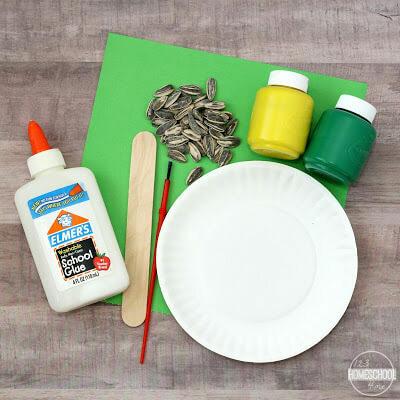 When the paint is dry, glue the craft stick onto the paper plate. Then, cut two to three leaves out of the green construction paper. If you are working with young children, you may want to draw the leaves on the paper and have them cut them out. Next, glue the leaves onto the craft stick. Finally, glue sunflower seeds onto the center of the paper plate. Have extras sun flower seeds? 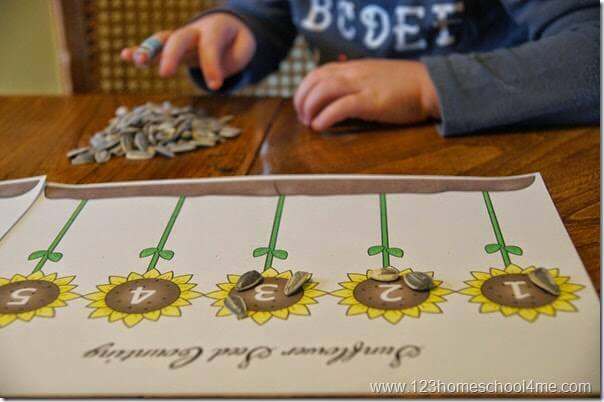 Try this free printable Sunflower Seed Counting Activity too! Read informational books about plants and flowers. Your children can learn all about what a plant needs to grow and the parts of a flower. 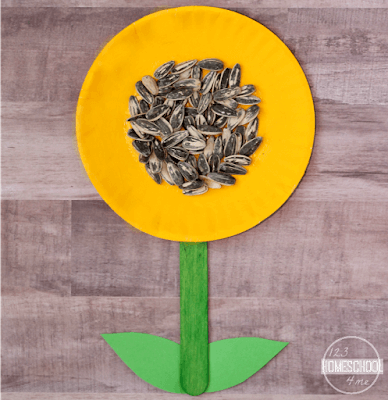 Plant sunflower seeds and watch the plant grow. We plant the seeds in cups first and then transfer them to the ground when it warms up outside. Have your children record their observations in a plant journal. 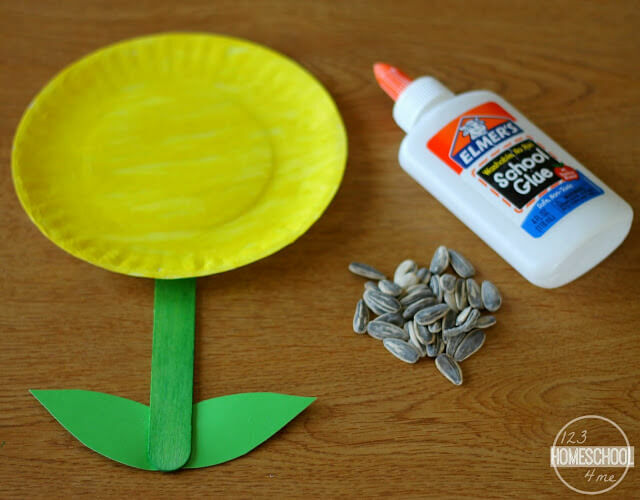 This Paper Plate Sunflower Craft is a fun and simple way for young children to celebrate that Spring is in the air and flowers are beginning to bloom.